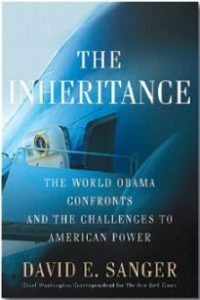 Book Review: THE INHERITANCE » Ambassador Fabian’s blog, KP Fabian, Analyst - international political developments, global issues, Indian national issues. Sanger begins with an apt quotation from Winston Churchill’s My Early Life about the unwisdom of starting a war. “Let us learn our lessons. Never, never, never, believe any war will be smooth and easy, or that anyone who embarks on that strange voyage can measure the tides and hurricanes he will encounter….” Obviously, the reference is to the two wars on Iran and Afghanistan that Bush started with more enthusiasm than judgment. Sanger wants to look backward “at the seismic events that led America to lose so much standing and leverage in the world and looks forward to re-imagine ways we can rebuild our influence and power”. Clearly, the book is not an attempt by a concerned global citizen to find out what went wrong with the Bush presidency and how best President Obama can lead the international community towards building a better world. The motivation is rather patriotic and nationalistic. In brief, the U.S. deaths count, not necessarily the Iraqi ones. Sanger wants to explore the “huge costs of distraction” under Bush. By focussing on Iraq in a reckless manner, Bush failed by and large to disarm the U.S.’ enemies. Iran pressed ahead with its plans for the nuclear bomb; Al Qaeda saw a chance to regroup; the Taliban saw its chance to retake territory; and other militants saw their chance to destabilise Pakistan. The North Koreans set off a nuclear blast. China concluded that a distracted U.S. was unable to react effectively to its rise. The key ingredients of the Bush legacy are inclusion of Iran in his “axis of evil” and his insistence on Iran discontinuing uranium enrichment even when there was no evidence that Iran was pursuing a programme to make atomic bombs. Bush got approved an amount of $400 million to destabilise Iran. Though Obama has sent some conciliatory signals to Iran right from the beginning, he has failed so far to achieve a breakthrough. The direct talks between Iran and the U.S. in Geneva (October 2009) is an important indicator of the prospects of reconciliation between the two. Has Obama taken too long to make the right move? The reader is left to wonder: Does Obama realise that he will not be able to do what he wants to do in Iraq and Afghanistan without Iran’s support? Maybe. Does he realise that the best way to prevent Iran from pursuing the bomb option is to agree to enrichment up to the industrial grade and flood Iran with International Atomic Energy Agency (IAEA) inspectors? Maybe. Does he have the freedom to overrule Israel, which wants military confrontation with Iran and the resultant chaos in the region? We do not know. If Obama wants to signal Iran that he is serious, all he has to do is de-freeze the Iranian deposits in U.S. banks. It seems, at least for the time being, that a good part of the Bush legacy prevails. We have to conclude that so far Obama has not succeeded in putting a reset button on the relations with Iran, and the inheritance from Bush weighs heavy. Let us hope that the resetting of the button has begun. Bush had a weakness - he liked to compare himself to history’s great ones. In April 2002, he went to the Virginia Military Academy from where General Marshall had graduated 101 years earlier. Bush said, “Marshall knew that our military victory against enemies in the Second World War had to be followed by a moral victory that resulted in better lives for individual human beings.” The “Marshall Plan” for Afghanistan turned out to be more rhetoric than action. This reviewer understands well that for Obama the presidential candidate, it was politically correct to endorse the war in Afghanistan, especially since he had opposed the war in Iraq. By endorsing the war in Afghanistan, Obama shored up his national security credentials. But as President, he has the option to ask, and seek an answer to, the fundamental question: Is it a winnable war within a sustainable time frame and cost, with the means available to the U.S. and its allies? If the answer is in the negative, as seems to be the case, he can take consequential action. Has he asked the fundamental question? It appears not. He has basically arranged for a “surge” in Afghanistan, and the thought of a defeat a la Vietnam does not seem to have been taken seriously. Obama risks repeating the historic error of another young President, John Kennedy, who, much against his better judgment, permitted the CIA to go ahead with the disastrous Bay of Pigs operation, and later through the lesser-known Operation Mongoose, which generated the Cuban Missile Crisis. The section on Pakistan, “How Do You Invade An Ally?”, is indeed insightful. Sanger went to visit Khalid Kidwai, the man in charge of keeping Pakistan’s nuclear weapons safe from Al Qaeda. Since 9/11, Washington started worrying about the safety of Pakistan’s nuclear weapons. An amount of $100 million was secretly set apart for this purpose. Asked about the threat from Al Qaeda, Kidwai told Sanger that it was “overblown rhetoric”. Kidwai claimed that the security system was safe and that there would never be any repeat of A.Q. Khan. Sanger was hardly convinced. He also failed to get a clear answer to the question about how the secret fund of $100 million was spent. Kidwai proudly told Sanger that Pakistan did six tests against India’s five in 1998. In October 2001, Bush sent Secretary of State Colin Powell for a “general-to-general” talk with Pervez Musharraf about the safety of Pakistan’s nuclear weapons. Powell made no headway. In 2005, Musharraf told the author that “any hint or rumour that he was allowing American hands to be put on Pakistan’s great source of power would be a death knell for any Pakistani leader”. Washington considered and rejected the idea of giving the PAL (Permissive Action Links) technology to Pakistan. The PAL works like an ATM up to a point. If you type in the correct numbers, you get your money from the ATM. In the case of the PAL, when you type in the wrong numbers more than once, the nuclear-armed missile will get disabled. On its part, the Pakistan Army was not keen to get the PALs from the U.S. They feared that the Pentagon might disable the missiles through remote action. As far as Sanger could make out, under Bush no real progress was made in “securing” Pakistan’s nuclear weapons. Initially, Bush was taken for a ride by Musharraf, and the latter was seen as a reliable and true ally in the war on terror. By January 2008, he began to doubt Musharraf’s ability and willingness to deliver what the U.S. wanted in the war in Afghanistan. He slowly, and reluctantly, understood the reasons for the Musharraf policy of keeping the Taliban option open to be used when a weary U.S. eventually started withdrawing. Before visiting Washington in July 2008, Prime Minister Yousuf Raza Gilani arranged for a raid on a big madrassa and told Bush about it. Bush told his interlocutor that he had heard that some of these raids and arrests “amounted to less than met the eye”. Gilani was puzzled. A Bush aide told Sanger that he would not call it “the President’s worst meeting with a foreign leader ever”. At the joint press conference with Gilani, Bush complimented Pakistan as a “vibrant democracy” and said twice that he “respects” Pakistan’s sovereignty. Of course, he did not make any mention of the order he had already issued to the Special Forces to enter Pakistani territory. Sanger draws an important lesson from Bush’s dealings with Musharraf. Bush “invested far too much confidence in his personal relationship with a single strong man, exactly the mistake that he rightly criticised Bill Clinton for making in dealing with Russia during the [Boris] Yeltsin years”. Bush thought that he could pick up the phone, talk to Musharraf, and get what he wanted from Pakistan. It is only in the past 18 months or so that Bush started to realise that he was wrong about Musharraf. After two sections on North Korea and China, the author takes us to the epilogue. He starts with a quotation from Theodore H. White’s The Making of the President 1960 to the effect that Kennedy never believed that “men were powerless to ask new questions or define new rules, or that individuals were helpless as ‘the engines of history’ rolled towards them”. After a year in office, Obama cannot blame his predecessor any longer for the mess he left. Part of Obama’s task in the first year will be to destroy four illusions, two created by Bush and two created by his team during the election campaign. The first is that the international system installed after the Second World War, with the U.S. at its centre, can last. The second is that the rest of the world will naturally seek to emulate the U.S. model and embrace democracy, free expression, and free market. There is the third illusion, created by Obama’s team, to the effect that free trade caused America’s problems. In other words, the jobs migrated to Bangalore. The last one is that America will not need to use the Big Stick. It is exceedingly difficult to predict the course of a presidency. Bush in his campaign projected a “humble foreign policy”. But, in fact, Bush entered the White House “with much certitude, but little compass”. Obama’s situation is different. “The troubles are so large that the country - and the world - is primed for big solutions.” Obama cannot only deal with the crises but also change the system that generates such crises. Dean Acheson, President Harry S. Truman’s Secretary of State, wrote about being “present at the creation”. Obama and his wise women and men can be present at the recreation. Sanger’s book should be read by the global citizen in order to understand the U.S. psyche. There is a frank admission that Bush messed it up. There is hope that Obama will undo the mess, if he can get his act right. But, for the reader, the key question is whether Obama is getting it right. His talking to Iran is a move in the right direction. His move to hasten the establishment of a Palestinian state might boomerang. If he persists, he might lose his second term, as Carter did when he gave asylum to the Shah. It will be more prudent to focus on the Israel-Palestine imbroglio during the second term. But, the U.S. public will judge him primarily in terms of the pace and strength of the economic recovery.